Whilst waiting for the installation of Exchange binaries on our third Exchange 2013 Proof of ConceptDAG node, I got thinking. It would be really nice to differentiate these servers in some way so that the operator knows what platform they’re working on. BGInfo would have been a way, but I wanted something bolder, more colorful, more ‘the interface formally known as Metro’. Some thoughts on this: The image is a heck of a lot smaller in JPEG and due to limited colour palette does not suffer for being compressed. If you’re distributing this over your network, why not save a few packets and go JPEG? Before the next stages, upload your JPEG/BMP to a network share that is ubiquitously accessible by ‘Authenticated Users’ on your Domain. Open The Group Policy Management administrative tool and create a new GPO linked to your target OU. Edit the new GPO by right clicking on it and selecting ‘Edit’. Set the ‘Wallpaper Style’ setting value to ‘Fit’, to maximize the icon’s size. 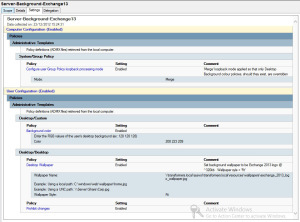 Enable the ‘Configure user Group Policy loopback processing mode’ setting in ‘Merge’ mode. This will apply your Desktop background GPO without removing other GPO’s applied to the user’s user object. If there is a conflict (e.g. they already have desktop background GPO’s applied) then the computer object’s user settings will take precedence. Note: You cannot scope which settings are applied using this GPO, or restrict it’s application to certain machine types using WMI filtering as it relies on both Computer & User settings being applied to work! Once the GPO has applied (you can force this using GPUPDATE /Force) you will find that when a user logs onto the machine they will have a gorgeous new wallpaper. An enhancement on this would be using BGINFO.exe’s native wallpaper application/manipulation abilities. Look at Rich Vanover’s TechRepublic article here for more guidance on that approach.